"A.J. 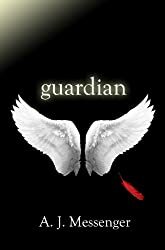 Messenger starts a trilogy with Guardian...Within this everyday world is a great cast of characters who bring life to the story -- a feat that couldn't be done without Messenger's distinctive literary style and voice. From the ordinary comes the extraordinary, where one's character and motives are tested. Where what one wants and what one needs may not co-exist; where duty and love are in conflict. Messenger writes an emotional, tender love story about possibilities." Please enter your email address and click the Follow button to follow A.J. Messenger!